A police officer has been dismissed for not turning up to work while a criminal investigation was being carried out on him. PC Alexander Rush was relieved from his post on Friday at a special case hearing held at Sussex Police Headquarters in Malling Down, Lewes. In making his decision, chief constable Giles York said: “His conduct shows a clear disregard for his sworn duty to the public and his colleagues during such challenging times for policing in Sussex and nationally. Since January 10, Mr Rush from Brighton was subject to a criminal investigation, and on January 18 Sussex Police began its own gross misconduct investigation, the hearing was told. On May 23, Mr Rush told Sussex Police he wanted to resign – but this was rejected because of the internal investigation against him. On June 15, he wrote to Sussex Police saying he would leave the force after the 28 days’ notice he gave on May 23. After June 19 he did not return to work. Chief constable York said ‘the point blank approach’ PC Rush had taken to his duty ‘while still being paid by the public purse falls well below the standards of Sussex Police’. The tribunal heard how colleagues at the Brighton Licensing team where he worked ‘found Alex to be professional, supportive and team focused’ and ‘were sad about losing him from the team’. 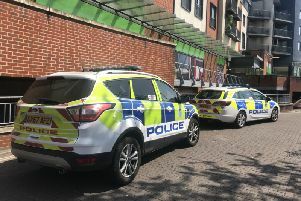 A Sussex Police spokesman said: ‘A 38-year-old man from Brighton was arrested on suspicion of common assault in January. He has been bailed. The investigation is continuing’.